The VASEM was pleased to welcome NAS President Marcia McNutt to the 2017 Summit. Dr. McNutt spoke to the importance of the growing movement to establish state academies across the US and how states are assuming leadership to address the forefront issues of our time using science-based solutions. In her address, Dr. McNutt noted that many states are stepping up to urgent challenges on issues of both state and international importance. 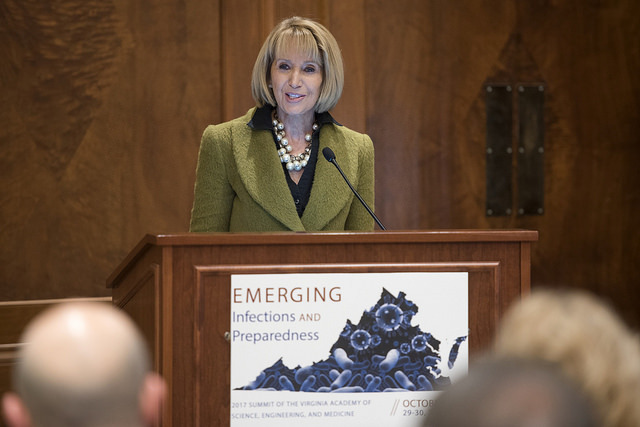 These issues include infectious diseases— the focus of the VASEM summit— and energy policy, climate change, education, and other important topics of our time.